BETHANY – Dr. Darin Brannan needed the space and money to bring in new equipment for his pediatric patients. 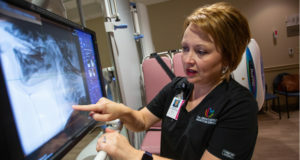 The pediatrician and vice president of medical informatics at the Children’s Center Rehabilitation Hospital sought to get the latest machine to improve images for swallowing studies. An anonymous donor and the construction of the rehabilitation hospital’s new tower made it possible. The Canon RadPRO Solegra 500 X-ray creates more precise images of patients swallowing liquids, gels and semi-solids during the procedure than the previous equipment, he said. The machine also emits a lower radiation dose, reducing the exposure to both the children and staff. The equipment can help staff conduct the test in less time, which allows them to perform more swallowing studies, Brannan said. “Obviously everyone is concerned about the amount of radiation kids are exposed to,” he said. Research in pediatric journals has shown that videofluoroscopic studies are more effective than simple clinical observation to determine the safest way to feed a patient, particularly for solid foods. If radiologists can ensure children receive less than the maximum dose per experience, then staff never have to worry about whether a child can receive another swallowing study in a few short months. Tim Smyth, the lead radiology technologist, said no one knows exactly how much radiation is harmful. The dose is designed to deliver as little as possible, attempting to limit each exposure to five minutes per study. The staff gets clearer pictures on the monitor too than the previous machine, which helps them develop rehabilitation plans for their patients. Erin March, a speech language pathologist and therapy manager for the Children’s Center, works closely with Smyth to perform the study. Those studies are used for children who survive accidents and then whose muscles atrophy. It’s also a helpful tool when a child’s feeding tube is scheduled to be removed and March’s staff must determine if the patient can safely swallow without accidentally aspirating food or liquids. Any patient who has experienced paralysis issues can have trouble swallowing. March and Smyth demonstrated how they use the new equipment in July and described how it is different than the previous machine. A large table rotates from a horizontal position to a vertical position in just a few seconds; other equipment require several minutes for that move. The child is placed in a chair, booster seat or wheelchair and then placed next to the now-vertical table. The machine can expand to any size, so a large adolescent or a child in a large wheelchair can fit between the table and the X-ray machine. Smyth stands behind a lead wall with a lead-lined window to position the machine above the child’s shoulders, creating a profile-view of their face and neck. March then spoon feeds the child mixtures of barium-infused liquids, solids and gels. Having a lower radiation dose to get a clearer picture is vital, March said. For example, children with cerebral palsy can take longer to swallow than a typical child. With a larger piece of machinery, it’s easier to keep the children comfortable while they’re confined and sitting still for several minutes, compared to the old machine, she said. The first patients were seen on June 1. The new equipment cost nearly $344,000. Children’s Center is one of 17 in hospitals in the nation that have the machine, which helps compliment the center’s overall expertise in managing complex medical conditions, Brannan said. It’s too soon to tell if the patients have experienced better outcomes, but Brannan said the staff can already tell the image quality is far superior to the previous machines. That allows staff to make a diagnosis without question, he said.